Awl free ob us kittehz mayks yoos ob papa-furnichur onna reglar baysis. Sofia teh mostest. Mamaz nawt neerly as akkommodaytin … speshly wiff teh goggie hangin arown. Congrats, AP lukks liek u hab a solow! Congaratz AP! Yu has teh solo!! Anni an my finnerz nawt fast enuff tuday! Fankeez, ‘niser! Ooh, luukit awl teh appityzers! gud too sea taht aim knot aloan in sea in stranj werdz taht mayk moore sinse wehn i luk ait tehm a nawt-furd thyme. muss bea dees durn glarsz. yah, dat zit!! 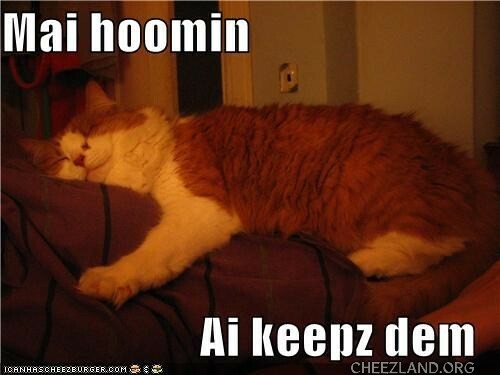 Dey feeds ma an maeks a kumfee sleepee [plaes! cuz dey awlsew feeds demselffs too!! Ai’m shore dey are wirthee. Onleh wen dey nawt keeps wigglollin! *mayks biskits on teh belleh* Settlol daon! Affer alla da eggsitemint ub seein BOFF Hugh Manatee and the LOLRus, da kittehs finally herded alla der hoomins bakk inna der kars (hoomins – sew EZilee distwakktid) sew dey cud karry onto da pikkinikk site…. Da hoomins wuz onlee onna da rode furr elebenty moer minoot minues wen …. Dey fownded teh purfekt spawt. Dey spred owt teh pikkinikk blankitts adn opened up teh pikkinikk baskets, ware tehy fownd . . .
Hunt for crikkits or cee kay dahs or sumfing to mayk teh dry bred mor palla. . pallataballah. . . tayst moar bedder. Hay, Wii haz sum Spamz heer!! Yea furr SPAM! Now alla wee gotta doo iz to …. *seize hoomin wakkin bak frum da baffrum* Oh lukk! Der it is! Gud fing he’z a kwik lerner. Dey taked away hims burr kollekshun? Whut will he do nao for a hobby? Hmmmm… Himz haz startid ta doo wut moss guys doo… hang out alla da dai wiffy hims buddy Mause – hoo iz a cat. Dey lay inna da sun an sleeps and den getz ups an chase da gurls a leetlol den sleeps agin — wiffy eetin frown in two. *nod nod* Tippykal boicat. Adn ai spoze he brings yoo, um, prezzints? In Cheezland, the time is 19:13.